Pre exposure prophylaxis (﻿PrEP), is a medication that when taken daily, can lower the risk of HIV infection. 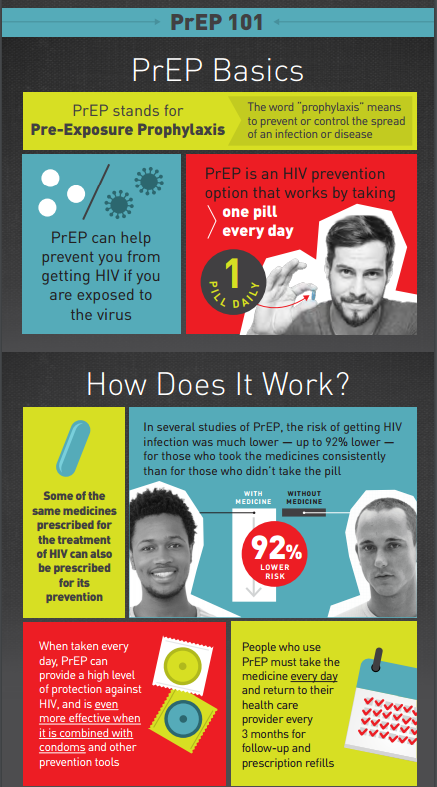 When taken as directed, PrEP has been shown to reduce the risk of HIV infection in people who are at high risk by more than 90%. PrEP is much less effective if it is not taken consistently. PrEP is a powerful HIV prevention tool and can be combined with condoms and other prevention methods to provide even greater protection than when used alone. Please remember, PrEP must commit and does require medication adherence and 3 month follow up with provider.